J.D. Lyle is a licensed Coast Guard Captain and guides in Texas & Oklahoma. Captain J.D. Lyle has been fishing Lake Texoma for since 1999. He is a full-time guide and is on the lake over 250 days per year! More days on the water keeps JD dialed in on the ever-changing patterns of Striped Bass! This dedication makes JD the premier striper guide on Lake Texoma. JD’s business is driven by repeat customers! He enjoys watching other people have a great time and catch Striper! Captain J .D. 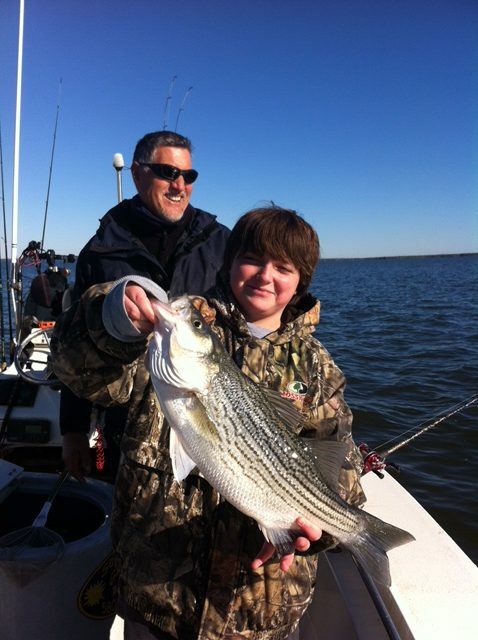 guides only on Lake Texoma and focuses specifically on Stripers. He fishes Lake Texoma with both artificial and live bait. Lake Texoma Fishing Guide-JD Lyle-Striper Fishing Guide puts trophies in the net! JD specializes in Spring and Fall top water Striper trips as well as Winter Deadsticking! Captain JD Lyle is a year-round guide! Captain JD was featured on the “Lady on the Lake” TV show in 2006, 2007, & 2008. He was featured in a 6-page article in the November issue of the Texas Sporting Journal and in the December issue of Texas Fish and Game magazine. He also writes the monthly fishing report for Texas Fish and Game magazine. Jeff also writes the monthly Texoma fishing article in the Texoma Times Magazine. With one of the largest fishing boats on the lake, Captain JD can offer more comfort for the smaller groups and fish up to 6 people. We can still arrange multiple boats for larger corporate or family trips. The boat is equipped with state of the art electronics, a VHF radio for safety and communicating with other guides and with a 250 HP Yamaha 4 stroke engine that will not only get you there in comfort but will get you there in a hurry! 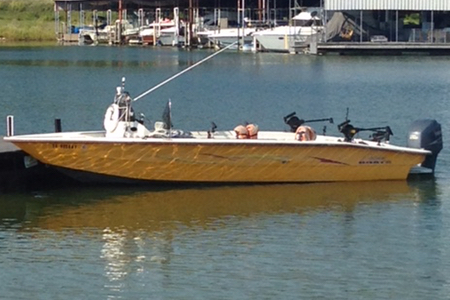 26 foot Outback Boat for Lake Texoma Striper Trips. Our Rates are great! Come catch with the best guide on Lake Texoma winter, spring, summer, or fall! We make lifetime memories one trip at a time! We get booked up very fast, so make your reservation NOW! Lake Texoma Striper action is fantastic, come get some soon! Lake Texoma is the premier Striper Lake in the USA! Let the best guide put you on a premier Trip of a lifetime! A $100 per boat deposit is required to reserve a date. Dates can be reserved with a valid credit card. Full payment in the form of cash, check or credit card is accepted on the date of the trip. A four percent fee will be added to all credit card payments. Cancellations due to bad weather on single boat trips are to be determined by the guide at the trip departure site on the date of the trip. In this case, no monies will be paid by the client. Any deposits will be moved to another date or refunded. Cancellations made 5 days or more prior to trip date can be rescheduled and deposit will be applied to new trip date. Cancellations made less than 5 days prior can be rescheduled but a deposit will be forfeited. NO SHOWS will be charged a maximum boat charge. Please Note: If you cancel a trip that means I have most likely turned down other clients requesting that date. Guiding is how I make my living, I cannot afford to be losing trips due to cancellations. Kids Under 10 Fish for $ 50 each after the minimum is met. One Kid Rate allowed for each paying adult. We can accommodate groups of any size. The million dollar question every angler asks Lake Texoma Fishing Guides, “When is the Best Time to Striper Fish?” This question is a very easy answer, anytime you can! It all depends on what the angler likes! Do you like to throw swimbaits, Topwater Plugs, Jig with Slab Spoons, or Drift Live Bait? Break out that GoreTex 100mph suit, it’s time to Deadstick for big Striped Bass on Lake Texoma! Once the water temperatures on Lake Texoma reach 55 degrees or colder, it’s time to put the shad tank up and break out the Deadstick Lures. 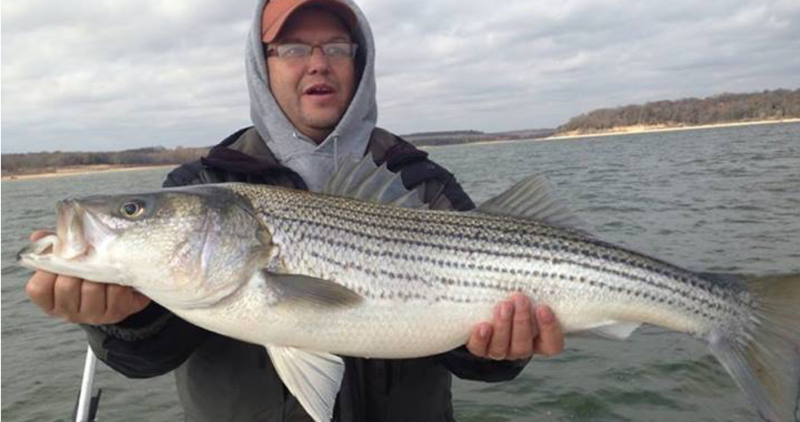 If you like to catch 10 plus pound Striper in artificial lures, try a Winter Trip with Lake Texoma Fishing Guide JD Lyle. The weather starts to warm up the lake from a long winter and the shad start to look for the bath water! We hit the rocks in March! The sun comes out, warms up the rocks, the rocks warm the water, shad move in, and the Striper follow the bait. 1/2oz jig heads and swimbaits in less than 10 feet of water make for some very exciting early Spring Trips! April can get a bit of a slow down due to the Spawn. Lake Texoma Striper run up the Washita and Red River to spawn each April. We catch fish on live bait staged at the river inlets. We practice catch, photo, and release of the big females full of eggs, but don’t worry limits of White Bass are easy and taste great! Watch out once the water temperatures reach 70 degrees Lake Texoma shows all anglers and guides why it is the Striper Capital of the World. Live Bait is great, but we also have very good days with Swimbaits and Slab Spoon Lures. The lake gets crowded and the guides get booked up fast. If you want to Striper Fish Lake Texoma in the summer, book your trip early. This is our busiest season. 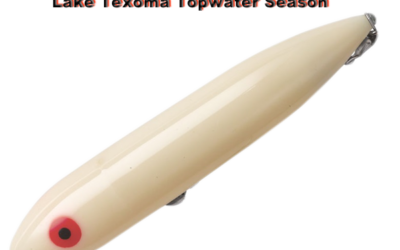 The beat-down of a HOT Summer is ending and September is Topwater Plug time! If you like topwater action and cooler weather come visit in September. October the birds return for the winter and as the water temperatures cool, Striper put on their feed-bags for winter. October is my favorite month. Crowds die down and fish is great in October and November! Try a fall Lake Texoma Striper Trip and you will come back each year. We catch Striper on Live Bait, Swimbaits, Slab Spoons, Topwater Plugs, and anything that has a hook! Lake Texoma Fishing Guide JD Lyle will post a blog report once a month, and give anglers a weekly report on Social Media. Please take a few seconds to LIKE our Facebook Page. 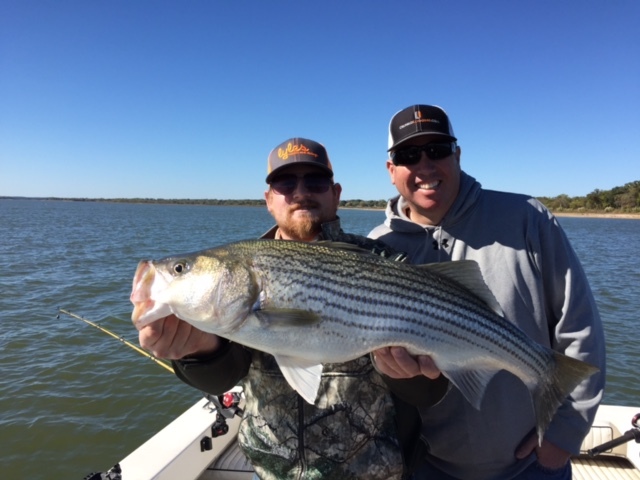 Our Lake Texoma Striper Fishing Report is one of the best and we love to share our knowledge with other anglers and clients. We find the more quality information we share, the more customers we gain. You will not find a website stuffed with Striper Fishing Recipes, State Park Reviews, or a copy and paste of the Fish Species of Lake Texoma! We do not spin articles to gain Google Rank, we put quality content on the website that anglers and clients enjoy and can use. Each month we will put together a Lake Texoma Striper Fishing Report that shares hot spots, water temperatures, water depth, lures used, where we are catching shad, and much more. We spend well over 250 days on Lake Texoma each year and like to share our knowledge and help anglers and clients. For more information please follow our Lake Texoma Fishing Report. Read More Lake Texoma Fishing Reports Here! We get a lot of emails and texts about our Lake Texoma Striper Fishing Trips. We like to have this FAQ section so clients can read a bit and find answers to questions before our big trip. The Number One Question we get is about the Lake Texoma Fishing License. We can NOT take anyone on a Striper Fishing Trip without a License. Since Lake Texoma is located in both Texas and Oklahoma, a Lake Texoma license is the best way to go. This allows you to fish anywhere on the lake. These licenses cost $12.00 and are good until December 31. You can purchase a Lake Texoma Fishing License at Walmart or buy them online. The Game Wardens do patrol the lake and may ask to see your license. We obey all laws and regulations. Everyone fishing in the boat age 16 and over will need a license unless they fall into one of the exceptions below. Children under 14 do not need a license. Oklahoma residents that are 64 or older can fish in all public Texas water without a fishing license. All they need is their OK driver’s license or ID. A Texas resident born before September 1, 1930, does not need a fishing license in Texas or Oklahoma. A Texas resident who is 65 or older and was born on or after September 1, 1930, has to buy a Texas Special Resident license (reduced price) to fish in Texas. No fishing license is needed to fish in Oklahoma. Non-residents 17 or older from all other States must buy a fishing license to fish in Texas. Texas and Oklahoma have a reciprocal agreement. An Oklahoma resident 65 or older can fish in Texas without a license, and a Texas resident 65 or older can fish in Oklahoma without a license. However, to fish in Oklahoma or the Oklahoma part of Lake Texoma, Oklahoma residents will need an Oklahoma Senior Citizen License. Oklahoma residents born on or after January 1, 1923, upon reaching age 64 (or those who turn 64 during the calendar year) may purchase a Senior Citizen License which is good for the rest of their life. Oklahoma residents born before January 1, 1923, are exempt but must carry proof of age such as a driver’s license. Senior Citizen License applications are available through Department headquarters, field installations and license vendors. They can only be purchased through the Oklahoma Wildlife Department headquarters. On average our Lake Texoma Striper Fishing Trips will start around first daylight (6 AM CST) and last until 11 AM CST. The weather can change in a hurry o Lake Texoma so please keep an eye on the conditions and come prepared. Bring a cooler with drinks and snacks. Dress for the weather. Warm layers in the winter, and cool light clothes in the summer. Stocking Cap or Sun Hat. We are a Full-Service Lake Texoma Striper Fishing Charter. We will set a meeting time and place and launch from the marina at first light. I will call you the night before the trip and give your directions to the Marina and a meeting time. Please show up on time, it is very important to the success of our trip. Striper tend to feed at first light and being late to the Striped Bass Dinner Party will disappoint everyone. All the rods, reels, lures, terminal tackle, and live bait. Lifejackets and a very safe coast guard approved boat. We clean, fillet, and freezer bag your catch. Enjoy a day or two on the water with Lake Texoma Fishing Guide JD Lyle. Voted #1 Texoma Striper Guide! 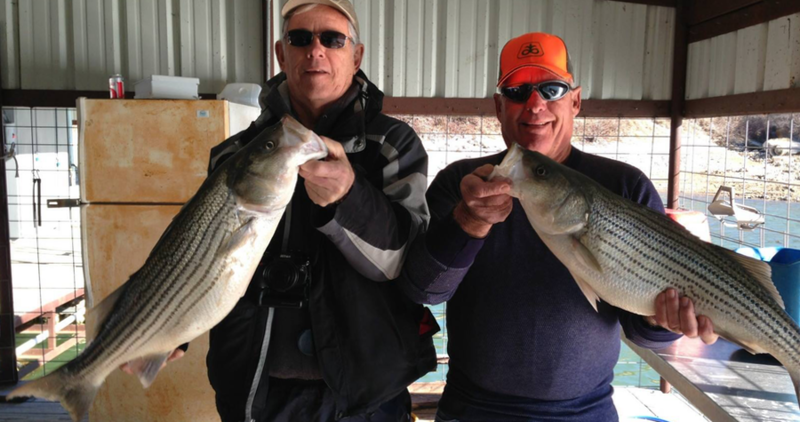 Lake Texoma Fishing Guide JD Lyle is the Best Striped Bass Charter Captain. Let 20 plus years experienced Striper Guide help you land the BIG ONE today!